Today, on the anniversary of the September 11 terrorist attacks, we honor our police, firefighters, EMTs, and all those who serve and have served in our armed forces. Day in and day out, these brave men and women put their lives on the line to keep us safe. But what makes these folks even more special, is that they go to work for their communities’ every day without expecting recognition. We believe that September 11 is the perfect day to show them our gratitude for their service. Here are four ways you can thank the first responders and military personnel in your community. When you see a firefighter, police officer, EMT, or military personnel, thank them. It doesn’t have to be a long speech. Something as simple as “Thank you for your service” will go a long way at showing them that you appreciate them. One of the most powerful ways you can thank our first responders is to put it in writing. Send a hand-written card or letter to a local police or fire station. If you want to make a bigger impression, gather several letters and cards from the community and deliver them personally. You would be surprised the power of writing a simple “thank you” card has. Maybe they are sitting at a table across from you at a restaurant, or behind you in line at the grocery store, or the drive-thru. Consider paying for them. It’s a small thing, but it makes a big impact. You can show your support by donating to or supporting organizations whose purpose is to support first responders, military personnel and their families. First responders and military personnel serve our communities daily and do so without expecting any gratitude. While we encourage everyone to appreciate what these individuals do each day, please take a moment on this anniversary of the 9/11 attacks, to recognize the men and women who continually and tirelessly serve to keep us safe. Join us for Cruise-In for a Cause! 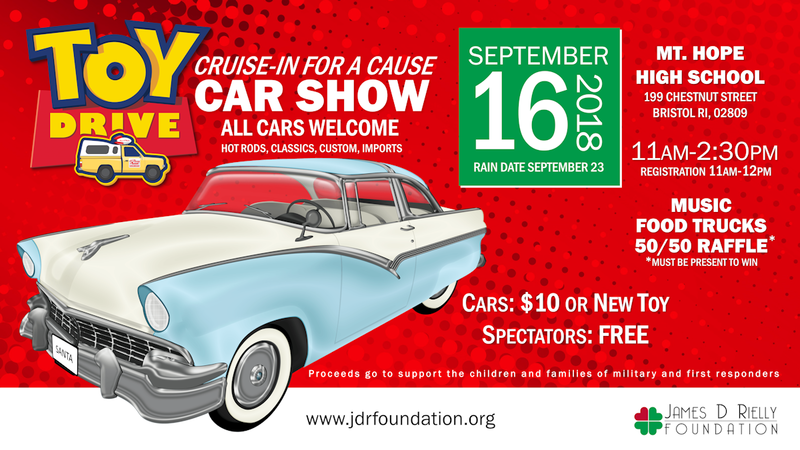 The James D Rielly Foundation will be holding its first annual “Cruise-In for a Cause Car Show” to benefit the children and families of the military and first responders on September 16, 2018 in the beautiful bay-side town of Bristol, Rhode Island. Included in the show will be cars of every kind: Antiques, Classics, Muscle Cars, Hot Rods and Special Interest cars of all types and sizes. A 50/50 raffle and music from the 1950s and 1960s will make this day one to be remembered. who has given you freedom of religion. who has given you freedom of the press. who has given you freedom of speech. who has given you freedom to assemble. who has given you the right to a fair trial. who has given you the right to vote. whose coffin is draped by the Flag. Today is the 110 year anniversary of Jim Rielly’s birthday. Born in 1908, James (Jim) D. Rielly was a lifelong resident of Bristol Rhode Island. His love for country and community was immediately evident when you met him. In many ways, he was Bristol’s unofficial Ambassador. To paraphrase Yeats: There were no strangers to Jim Rielly; only friends he had not yet met. Jim Rielly was well known throughout Rhode Island and much of New England for his generosity and countless charitable acts; but most notably, Jim Rielly was known as Rhode Island’s most famous Santa Claus. 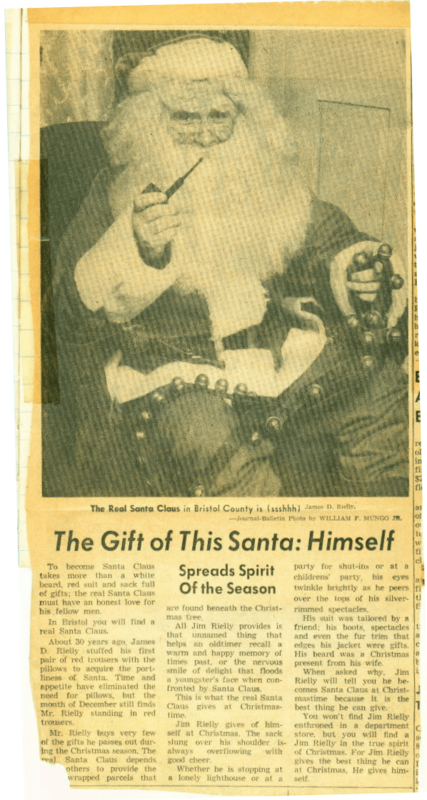 His first appearance as Santa Claus was in 1927 at the beginning of the Great Depression. At the age of 19, the young Jim Rielly portrayed Santa Claus for a family living in an abandoned chicken coup. For the next 62 years, Jim Rielly would continue to appear as Santa Claus wherever he was needed, but primarily at charitable events, nursing homes, hospitals, orphanages, military bases, and private homes. He took no payment for any of his appearances. 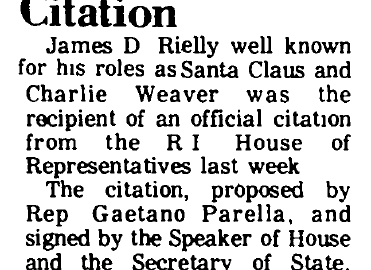 On January 31, 1979 he was entered into the United States Senate Congressional Record as “James D. Rielly – A truly remarkable Santa Claus from Rhode Island”. And on December 22, 2010, he was one of the inaugural inductees into the prestigious International Santa Claus Hall of Fame. In honor of his kindness and charitable works, the James D. Rielly Foundation was established to preserve his legacy by providing charitable support to the children and the families of military and first responders hindered by economic status, physical or mental challenges. Please consider making a donation to the James D. Rielly Foundation. Your donation is 100% tax deductible and will help bring unconditional love, hope, and joy to needy children and families. What is the meaning behind the James D. Rielly Foundation logo? 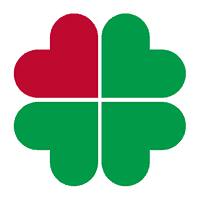 The clover represents the immense pride Jim Rielly had for his Irish heritage. Jim would often jokingly refer to himself as the Visible President of the Leprechauns. The shade of green in the clover is the same green in the flag of Ireland. Each leaf in the clover is in the shape of a heart. The single red leaf (or heart) represents the love Jim Rielly had for his country, the community, and the less fortunate. The red also symbolizes Jim Rielly’s role as Santa Claus and his love for all children. During the Middle Ages, it was not uncommon for wearers to don multiple rings, each signaling a different aspect of identity, from social class to political affiliation. 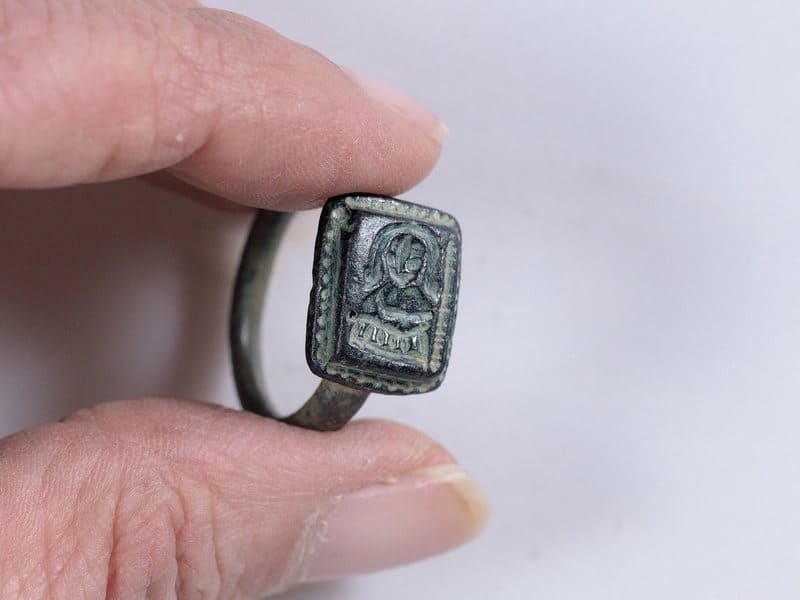 Last month, Dekel Ben-Shitrit, a 26-year-old gardener, found a 700-year-old bronze ring bearing an engraved image of St. Nicholas. The ring was studied by Dr. Yana Tchekhanovetz, an expert in Byzantine history at the Israel Antiquities Authority. Christian pilgrims to the Land of Israel from all over the Byzantine Empire (Turkey, the Balkans, Greece and present-day Russia) would carry his icon to protect them from harm. It is probable that the ring belonged to a pilgrim who sought the protection of St. Nicholas on his travels.